February 6th, 2019 by Jordan R.
When it comes to camping, there is a large part of North America that just can’t get enough of the outdoors. Some of that may start with Boys and Girls Scout Troops, and from there it starts to bloom. Then they grow up and enter the market, and we have consumers buying a Jeep® to install a pop-up, or a Ram pickup truck with the RamBox to store all their hands-on tools and a cooler. 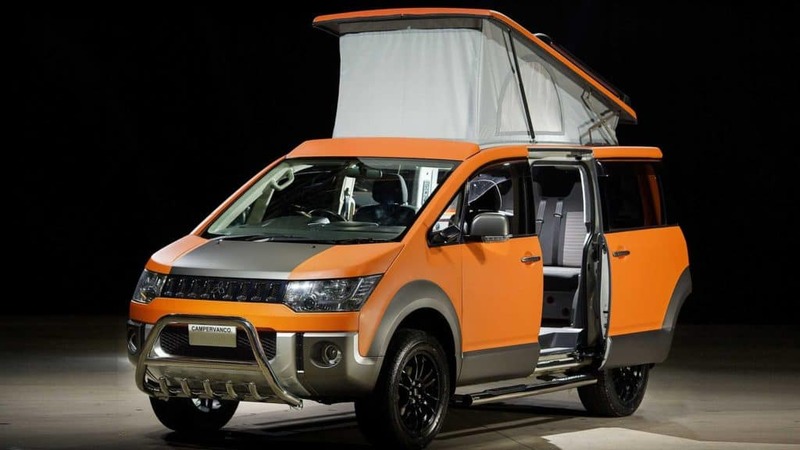 With Mitsubishi Motors inching closer and closer to a growing market in North America, overseas, a Scottish company showed the world the kind of camper a recently new overseas Mitsubishi Concept can turn into. Campers Scotland is of course based in Scotland and claims to be the country’s “premier campervan retailer.” They have all sorts of gear and equipment one can install for a variety of environments and activities. Like several auto shops out there that work with custom installations or modifications, Campers Scotland played their own hand at a mod by turning a Mitsubishi Delica into a camper. The name should ring a bell. The new Mitsubishi Delica Concept in Tokyo looks like quite the rugged, off-road, boxy SUV- or van. It comes with the sliding doors of a van, an overhead LED bar, a robust front fascia, heavy-duty guard rails, under-guard bars, red mud flaps, and a few other accessories that make it off-road capable. This thing can also seat six with four bucket seats and one 50/50 split bench. To say the least, it’s interesting. Campers Scotland based their camper on the 2007 debut of the minivan-SUV mashup, the predecessor of the current model, but we can’t help to think the new concept was the inspiration. Off-road and camping go hand-in-hand. Plus, the two share the same underpinnings, so one could say the same installation could be done on the new concept – for a price. Showing off the caravan and motorhome expo in Glasgow from February 7-10 2019, Campers Scotland will be presenting a motor home powered by a 2.4-liter inline-four engine but a diesel variant will also available with a 2.2-liter turbodiesel engine. Four-wheel drive is the permanent powertrain. Because this is more than a caravan, some would call it an RV that can accommodate up to four people but comes with a fridge and a small but tough kitchen that is powered by roof solar panels that store energy into a lithium super-power battery pack. Once campers arrive at their destination, pop the roof, elevating to provide some additional space and maybe fresh air. We thought this would be a great time to bring up another market in North America that is currently growing, and Mitsubishi Motors is shy to enter – pickup trucks. The 2019 Mitsubishi Triton is currently riding overseas, and we’re curious why Mitsubishi is so timid to bring it to the North American market. With its off-road capabilities, it has great competition with Jeep and Ram to build up their image. What do you think about these new vehicles and mods for Mitsubishi Motors? Let us know on University Mitsubishi social media.